Each spring those living in the Northern Hemisphere look forward with eager anticipation to the warming sun and the coming growing season. To sincere Bible students, spring brings to mind much more, however. Spring means the month of Abib (meaning "green ears"), heralding the beginning of the new year, Ex. 12:2. Life starts anew with the warming sun and longer days. Barley, which has been planted in the fall, repsonds quickly. It will be one of the first cereal crops to be harvested. Wheat will follow some seven weeks later. True Bible-believers cannot help seeing the correlation between the earth's coming to life after a dormant winter and the rejuvenation of our spiritual growth which we renew each spring at Passover. In Yahweh's wisdom, He has given us seven annual holy times to remind us just why we were born. These annual Sabbaths also bring us into a closer spiritual relationship with Yahweh and the working out of His purpose here on earth. A deeper, blessed spiritual experience is ours as we participate in the commanded Feast Days given us in the pages of the Bible. These Feast Days were in existence and given long before Moses, being observed back in Genesis, as we will show. Egyptians, and it was the final plague whereby Pharaoh let Israel go. Passover occured in the midst of the Egyptians, which is a type of the world. All other convocations took place outside of Egypt. The lambs were killed; the blood was sprinkled upon the doorposts and lintels of the houses; and the flesh was eaten with unleavened bread and shared among the family of believers. no real Passover. There are the unleavened cakes, the herbs, the drink, but the Passover lamb is not present. And in the process of time it came to pass, that Cain brought of the fruit of the ground an offering unto Yahweh. Thus, Cain and Abel were counting days and Cain brought an offering of his crops, the fruit of the ground. Abel brought of the firstlings of his flock. It has been pointed out that Cain brought of the Tabernacles offering and his offering was rejected. Abel brought an offering of the flock (Passover lamb) and his was accepted. They both apparently brought their offering at the same time. 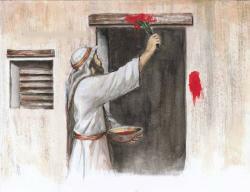 Abel’s was the proper offering; he came through the blood of the lamb. Cain brought of the labors of his hands, the fruit of the land, which was the wrong offering at the wrong time. The lesson is, we cannot approach Yahweh through our own works, our own ideas. We come through the atoning work of the Redeemer of Israel, the Lamb of Yahweh which takes away the sins of the world, John 1:29. Abel brought a sacrifice of a lamb, and Hebrews 9:22 tells us, “without the shedding of blood there is no remission” of sins. Cain, by his own reasoning, brought the works of his hands, and it was rejected. Jude 11 indicates that Cain’s religion is man’s natural religion, which Yahweh condemns, while Abel brought the firstlings, and the fattest ones, too (margin). Passover is mentioned in Leviticus 23 along with the seven annual festivals. It is to be kept annually, at the beginning of the year (Ex. 12:2), which is in the spring, usually March or April. Deuteronomy 16:1 commands us to keep the month of Abib, meaning “green ears” (of grain). There is no Biblical precedent for taking the fruit of the vine and the unleavened bread at any other time than the time of the Passover. Those who partake of the so-called “eucharist,” “mass,” or “L-rd’s Supper” are not abiding within Scripture. … this do as oft as you drink it in remembrance of Me. For as often as you eat this bread and drink this cup, you do show the Master’s death until He comes, I Corinthians 11:25b, 26. Other translations read differently, instead of “oft” and “often,” whenever is used. In no way does it mean to partake of it whenever we please! If we are told, “Be sure to serve turkey whenever you observe Thanksgiving,” are we free to observe the Thanksgiving holiday monthly, weekly or daily? Passover is observed at a specific time of year, as stipulated in the law (Ex. 12, Lev. 23 and Deut. 16). In the New Covenant era we do not sacrifice a lamb when we partake of Passover. Paul shows in I Corinthians 5:6-7 that the Messiah is considered the Passover Lamb for us. In the original Passover observance there was no mention of drinking of wine in the law of Yahweh. The morsel of unleavened bread signifies Yahshua’s body. The partaking of the cup signifies His blood. Nowhere in the Bible is the cup said to contain wine. The Savior called it “the fruit of the vine,” thus it could not have been water. It was the gehnema (Strong’s #1081) meaning product of the grape that could be drunk, the squeezed-out juice. Passover from early Bible times looked forward to the greater Passover Lamb, our Savior who was to die for the sins of the world. We are to remember His death by observing the Passover. Then follow with the seven days of Unleavened Bread. Purge out therefore the old leaven that you may be a new lump as you are unleavened. For even the Messiah our Passover is sacrificed for us. Therefore let us keep the feast…, I Corinthians 5:7-8? Why would Paul write to the Corinthian brethren about Yahshua being the Passover Lamb if these days were done away at Yahshua’s death and not necessary for Gentiles? Why did he further say, “Let us keep the feast!”? Obviously these feast days were still obligatory some 25 years after the death and resurrection of the Savior. And the record is preserved in the Bible for you and me to follow in our days as well. We know that the Savior told the disciples, “This do in remembrance of Me,” Luke 22:19. He also promised He would partake of the Passover anew in the Father’s Kingdom, Matthew 26:29. Leviticus 23:14 says this is a statute forever, throughout all generations. We show our love for the Savior when we keep His commandments, John 14:21.